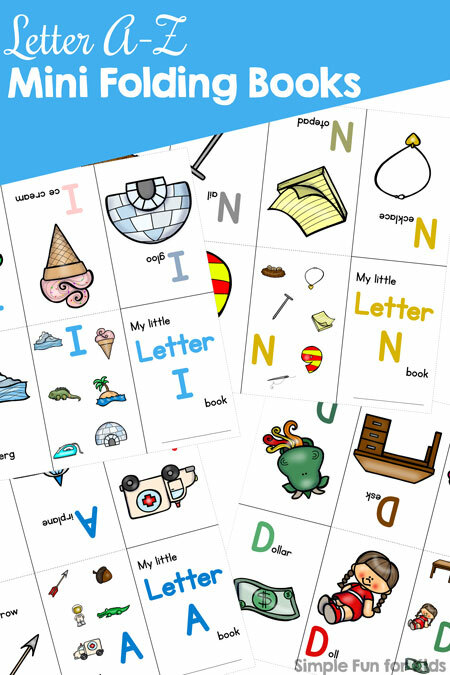 There are so many fun ways of learning the alphabet! 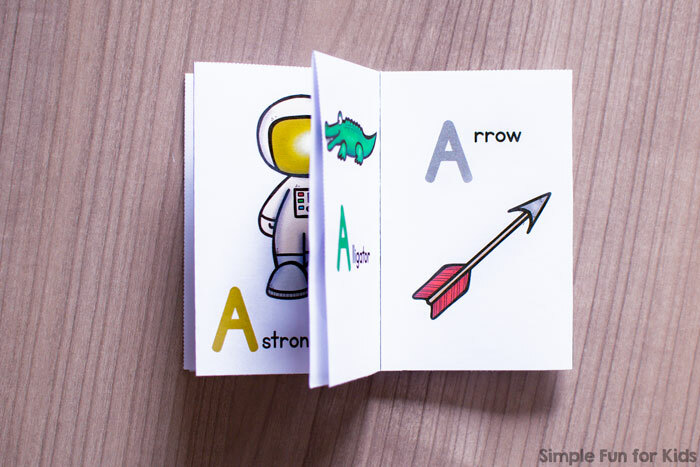 N is a big fan of mini folding books on all kinds of topics, so I decided to make him a set of Letter A-Z Mini Folding Books to read through at his leisure. Well, I started with letter A to see how it went, and it was such a big hit, I couldn’t make versions for the other letters quickly enough! And when I posted the first video on my FB page, my readers got very excited as well and started asking for a complete set. I’m happy to oblige: You can now buy all 26 mini folding books plus the same 26 books in black and white for a total of 52 mini folding books and download them with one click! Each mini folding book is made from one sheet of paper with minimal cutting, some folding, and no gluing. You don’t even need a duplex printer thanks to the genius construction of these booklets. Each booklet has eight pages, including a title page and a back cover that shows all of the images in the book. For each letter, there are six different images that start with the letter the book is about. On each inside page, there’s one of the images plus the matching word with the upper case beginning letter in a large font in a color taken from the image. Each letter book also comes in a black and white version perfect for coloring and/or saving ink. Letter A: ambulance, airplane, astronaut, acorn, alligator, arrow. 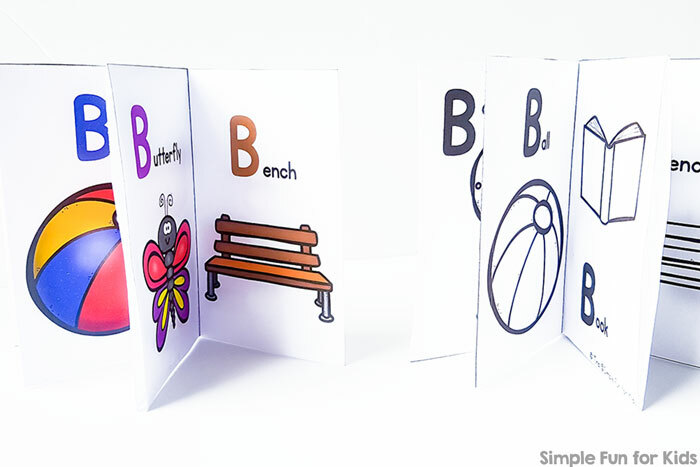 Letter B: balloon, button, ball, book, butterfly, bench. Letter C: camera, candle, cup, cookie, cupcake, caterpillar. Letter D: door, dress, desk, dragon, dollar, doll. Letter E: elbow, eyes, envelope, elevator, eagle, elf. Letter F: fish, finger, flower, fire, fence, fan. Letter G: gate, grass, glove, glass, ghost, glue. Letter H: hat, hammer, helmet, helicopter, heart, house. Letter I: igloo, ice cream, island, iguana, iron, iceberg. Letter J: jello, jump rope, juice box, jellyfish, jam, jacket. Letter K: key, ketchup, king, kiwi, kite, kangaroo. Letter L: ladybug, lego, lamp, lollipop, lemon, leaf. Letter M: magnet, mitten, mouse, mailbox, mushroom, milk. Letter N: necklace, notepad, nail, nest, needle, nine. Letter O: orange, oven, owl, onion, octopus, ostrich. Letter P: popcorn, pencil, penguin, pig, pizza, pants. Letter Q: question mark, quadruplets, quarter, quilt, quesadilla, queen. Letter R: ribbon, rose, robot, rocket, ring, raspberry. Letter S: sandwich, scissors, salami, sunflower, sock, seven. Letter T: tree, tie, triangle, tag, toothbrush, tomato. Letter U: unicorn, under, unzip, uniform, up, umbrella. Letter V: vegetables, volcano, vacuum, violin, vest, valentine. Letter W: watermelon, worm, well, wall, window, windmill. Letter X (beginning/end): box, xray, xray fish, six, ax, xylophone. Letter Y: yawn, yoyo, yogurt, yard, yarn, yoga. Letter Z: zucchini, zipper, zoo, zero, zebra, zigzag. If you prefer, this product is also available in my TpT store.